Celebrate with me! My 3 month old son finally started focusing on things long enough to get through books! Not only that -- the pictures hold his attention, so long as you make appropriate noises to go along with what he's looking at! There is a picture of a toy train and a toy boat that he enjoys looking at with the accompanying soundtrack of "Choo Choo" and "Chug Chug." He also appreciates the pictures of babies which are scattered throughout the book. One picture in particular makes him laugh everytime he sees it. So now I'm on the market for picture books with real pictures in them. I have a stack of board books on his bookshelf but he doesn't care for most of them. He is easily distracted away from the book if it has pictures of the same thing over and over in it. (For example, we have a counting book with real pictures of dogs. He doesn't note the differences between the breeds so it is rather monotonous [for myself included].) He doesn't seem to care much for drawings. 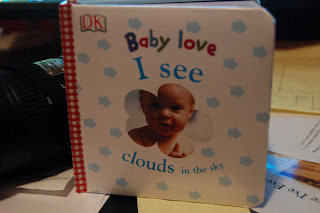 This book that I have and he likes is from the Baby Love series by Dorling Kindersley Publishing. Here is the link to their site. I've always liked their books but now that I know my son does I'm an even bigger fan! If anyone has suggestions for picture books, please pass them along. I can't WAIT for our next trip to the library!!!!! I think we have one from that series with ducklings. D2 loves it! Anything with photos of other babies is likely to be a hit at this stage (and for some time to come). I am a Bunny, by Ole Risom (I think--pictures by Richard Scarry) Not photographic, but beautifully detailed drawings of outdoor things, and the bunny enjoying them. The Real (Original?) Mother Goose board book--the one with the black and white checkered border. You've hit on one of the keys--find books that YOU appreciate (since you will be doing the reading), whether it's the art or photos or text. If you (and he) likes real picture books, the DK "My First Board" series is good. We have My First Truck book. Some cloth books are cool, because they have textures to feel, flaps to raise, and sounds to crinkle. Those are a good introduction to books as well. We had one of the Baby Einstein cloth/plastic type that he really enjoyed playing with. And thinking of books as toys is really cool. I mainly use my blog to recommend picture books. If you visit, click on the PICTURE BOOK RECOMMENDATIONS tag in the left sidebar. By the way, I found your blog from semicolon. These are not photo board books, but we like Eric Carle's books, especially Brown Bear, Brown Bear, What Do You See? and The Very Hungry Caterpillar, which is fun because they can put their finger in the cut-out holes. Our favorite for baby and toddler stage was I Am a Bunny (tall, cardboard book). I'm pretty sure they still sell it. It has beautiful pictures. How fun! I can't wait to have kids so that I can read them books. My friend had a book for her little boy that he loved, but I can't remember the name! It was a book about colors that had lots of different objects on each page, all in the same color. He loved it. Have fun! I am so glad you stopped by my blog this morning. When I first read this post I meant to look something up and come back and give a recommendation. So here are a couple. Check out the Busy Doggies and Busy Kitties by John Schindel. He has a few others as well. They are all board books and have great photos of animals. Also he has a book (not photos) called What did you See? Awesome and clever book. Your son will like it when he is a bit older. Another one-I Love Animals. ISBN 0312493916. There are great little blurbs to read from each photo.